SYDNEY, AUSTRALIA--(Marketwire - April 20, 2010) - HotelsCombined.fr -- the world's leading hotel search engine -- reports the top 10 domestic and international travel destinations for French residents in 2010. Statistics are based on the Web site's current booking leads for the upcoming year. 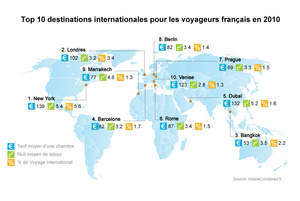 Paris and Lyon top the list for domestic destinations while New York City and London rank highest for international destinations. It comes as no surprise that the capital city Paris ranks as the number one domestic destination for French travelers in 2010. According to a February 2010 report by the Paris Tourism Research Department, in four years, the volume of French travelers to Paris has never been as high as it is today and overall hotel arrivals are up 4.7% year on year. Spokesperson Paul Roll, Managing Director of the Paris Convention and Visitors Bureau, commented, "Paris retains its position as the leading tourism destination thanks to a solid position that combines the right balance between business and leisure travelers. The richness of its offer and its cultural calendar are part of its traditional attractions and Paris has in recent years been such a dynamic and innovative city that it has undergone transformations at an unprecedented pace. The new rules and regulations in the hotel industry, including the creation of a 5th star, is a positive move forward for the Parisian hotel sector. By making it comparable with that of other cities, it is now possible to better highlight its competitiveness and its good quality/price ratio. And that is not all, with the creation of a hotel plan for 7,000 additional rooms on the edge of the city by 2020, notably major hotel groups will strengthen the competitiveness of Paris which remains vigilant to keep its capital in pole position in a competitive market place that has become even keener in the present economic situation." One of the most budget friendly cities, Bangkok, and one of the highest cost destinations, New York City, are both within the top three international destinations. 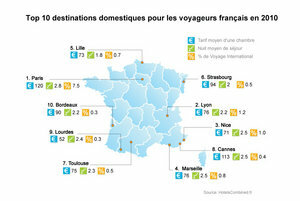 HotelsCombined.com General Manager Michael Doubinski said, "This indicates French travelers are making their travel choices based on the destination's unique experience and not solely on overall cost." HotelsCombined is the world's leading hotel search engine, with a database of more than 200,000 hotels from 195 countries. The site streamlines the largest amount of real-time international hotel deals into one simple and efficient format, aggregating prices from prominent online travel agents and hotel chains, including Expedia.com, Booking.com, Hotels.com, LastMinute.com, Intercontinental Hotel Group, Hilton Hotels and Carlson Hotels. For more information or to find unbeatable hotel deals, visit www.HotelsCombined.fr.